FIGURE2 ■ Multiplanar reformations reconstructions created for surgical planning. These images are created from thin-section data obtained in the parenchymal phase. 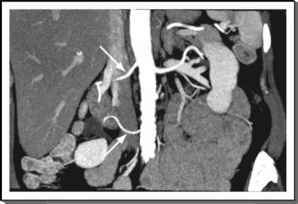 (A) Standard axial image shows a hypodense left renal mass (arrow) in the lateral interpolar kidney. Sagittal (B) and oblique coronal (C) multiplanar reformations help to delineate the position of the tumor (arrow) with respect to the remaining normal renal parenchyma and are easy to create at the computed tomography scanner console. FIGURE3 ■ Thin-slab maximum intensity projection reconstruction. This image created for surgical planning is created from thin-section data obtained in the vascular phase. Coronal oblique maximum intensity projection through the aorta shows two right renal arteries (arrows). The most sensitive technique used to determine the presence of lesion enhancement is image subtraction. exams (23). 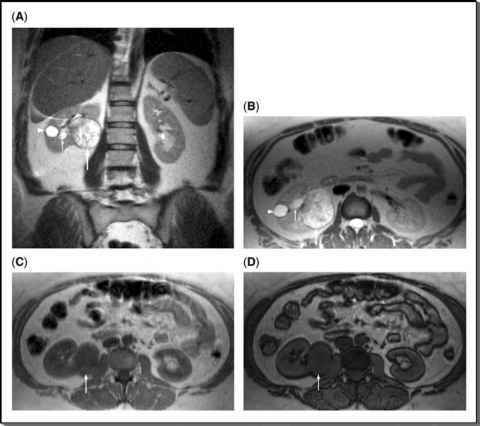 As in most body magnetic resonance imaging, the precontrast T1- and T2-weighted imaging is performed to evaluate anatomy, identify abnormalities, and begin characterizing any identified renal or adrenal lesions (Fig. 4). Following intravenous gadolinium administration, postcontrast T1-weighted sequences are performed in multiple phases to define the enhancement characteristics of lesions and to define the anatomy for surgical planning, specifically the arterial, venous, and collecting system anatomy. The importance of patient preparation and general technique in body magnetic resonance imaging cannot be understated. 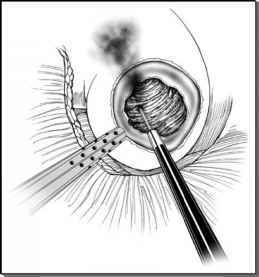 Anterior and posterior phased array surface coils, rather than a body coil, should be used to increase the signal and must be positioned over the kidneys. Patient motion during image acquisition, including respiratory motion, leads to image blurring and artifacts. Eliminating this motion is an important factor in improving imaging quality in body magnetic resonance imaging. In addition to eliminating image artifacts from respiratory motion, the reproducible suspension of respiration is needed to take advantage of a variety of postprocessing techniques. FIGURE 4 ■ Precontrast T1- and T2-weighted magnetic resonance images. Coronal (A) and axial (B) precontrast, T2 weighted (half-Fourier single-shot turbo spin echo) show the heterogeneous mixed intensity of this exophytic renal cell carcinoma (arrow), a homogeneously hyperin-tense simple cortical cyst (arrowhead), and a distended collecting system in the right kidney (thin arrow). 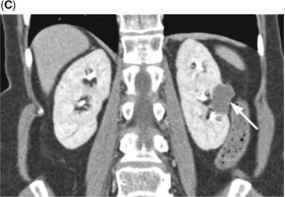 (C) Axial, inphase and (D) out-of-phase, precontrast T1-weighted images showing the generally low-precontrast, T1-weighted signal of a renal cell carcinoma (arrow). To perform accurate image subtraction, the datasets to be manipulated must be nearly perfectly aligned in three-dimensional space. Thus, this technique requires reproducible breath holding. This is especially true for evaluating small lesions. In anxious, nervous, or claustrophobic patients, using mild anxiolytic medication can allow diagnostic studies to be carried out in patients who would otherwise be unable to follow instructions. With this technique, images obtained before intravenous contrast are mathematically subtracted from images obtained with contrast, so that any remaining signal intensity represents enhancement. To obtain motion-free imaging with specific temporal resolution, the magnetic resonance sequences are kept as short as possible and patients are asked to hold their breath during image acquisition at end expiration. Breath holding is done during end expiration because it is more reproducible. This can be a challenge for some patients; in those who have difficulty suspending respiration at end expiration, hyperventilation and supplemental oxygen can allow longer breath holds, enabling examinations of a much higher quality.